Recently I found myself in a teleconference being legally sworn to testify information to a government agency. “Are you prepared to be sworn in?” came the voice from the speaker on the desk. We all know how this time-honored script starts and finishes so I found myself pausing – waiting for the rest of the statement to come. But all I heard was silence. Although only a second or two passed, it seemed unnaturally long. In my head I was waiting to the voice to finish the sentence with “so help you God”. Instead, all I heard was dead air coming from the telephone speaker. Suddenly I realized the voice on the other end was waiting for my reply. God was not invited to this legal proceeding. I’m not sure when someone decided to edit God from this particular piece of historical language, but I honestly felt insulted. I appreciate our world is a Gumbo stew of people, beliefs, and histories. But to most people, we still hold God in high esteem. Granted many in the world have different points of view on who represent their version of God, but one common factor in most religions around the world recognize a larger entity. According the Gallup, the world’s foremost institution for polling data in the world, more than 9 out of 10 Americans continue to believe in God (6/2011). So why would we remove such a compelling piece of language when everyone admita to believing in such an entity? Now as humans, we can always find ways to disagree on what God looks like or how He (She) presents themselves to us – but the fact is nearly all of us believe in a spirit to whom we wish to follow and look to for guidance. But to toss God out of the simple proceedings I found myself in seems a bit too much. I know from the teachings of my particular religion it is unwise to disown the knowledge or the existence of God or his representatives. By doing so, we are turning ourselves into ‘fair weather’ followers. Faith and beliefs – regardless of the religion – are not something to be acknowledged only when convenient or advantageous to us. So as I sat there during the proceedings I felt guilty for not speaking up and adding “so help me God” to the end of my swearing in process with the government that particular day. So next time I find myself in a similar situation I will not make the same mistake again. I will repeat the sentence as spoken – and then add four simple words that mean the world to me. I’m sitting on a stingily padded barstool in rundown wooden shack serving cold beer and fresh oysters fished out of the water only hours before. A man with a roughly cut white beard sits down two seats away. My new friend, that is someone I met in the past fifteen-minutes, turns and welcomes him. Tom, as my new friend tells me, is giving him advice on how to retire. Looking over at his rumbled floral shirt and a mop of white hair beneath a straw hat, I wonder where my friend is going with this. Turning back, my friend tells me he’s been an elementary school principal, a marine merchant and a truck driver. He’s looking to retire permanently after years of working different jobs. “Teaching school was good, but the superintendent was just too much to deal with,” he said leaving my imagination to fill in the blanks. Tom leans forward and catches my eye and introduces himself. “Yes, it’s all about keeping your overhead low and finding ways to keep from spending money,” he says. Pulling out a small knife and reaching for a nearby palm leaf, he proceeds to explain his secret. Before his sentence is done I realize there will be no advice on how to best position a 401K for long term growth. Placing the blade in the center of the green foliage, he pulls the leaf away from the blade as to control the cut. The question comes up about how long he’s lived here – that is along the Florida coast. “It must be nice living here – living in paradise,” someone else says. “Yeah, I guess so,” he says as he folds two of the newly cut strips of green into a curiously contorted shape. A large tray of oysters lands in front of me and I think back to how my wife always says she’d love to live along the coast. I look back down the wooden bench to the man threading strips of green into an increasingly recognizable shape. I smile thinking maybe, if his plan plays out, in a few minutes he’ll trade them for a free beer or two. His words – not the ones about his retirement plan – continue to hang in my mind. How does a day in paradise become just another Thursday? Paradise is a tricky proposition. Is it the allure of being somewhere different from where our stakes are currently planted or is it a destination we will all one day hope to reach? In the end, is paradise a physical place or a state of mental being? Suddenly a form rises from the cut leaves on the table. His creation is truly beautiful. Looking down the wooden table I realize the search for paradise is not for me to answer. Each of us will need to find our own calling, our own destination, on our own terms. The answer, however, lies between our ears and our heart. 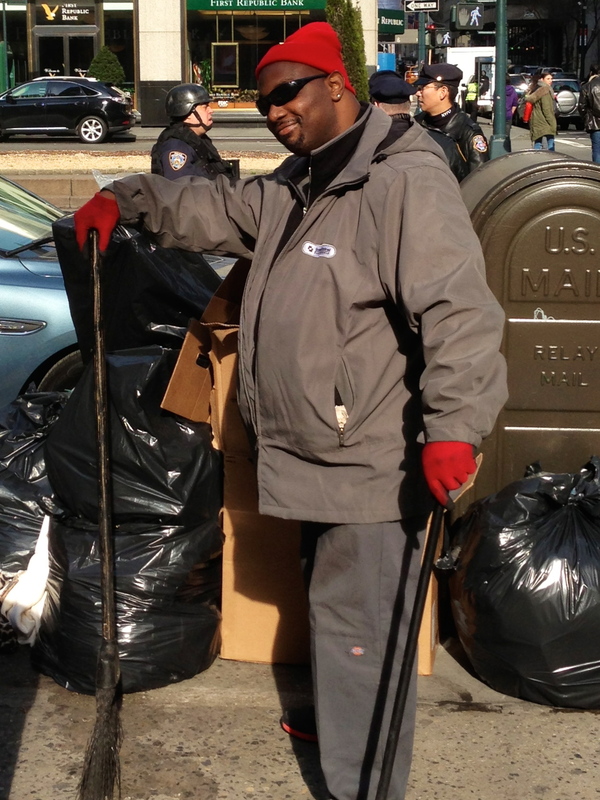 The nicest person I met in New York City was a street sweeper. Walking out of my hotel last week I turned to the right to visit a beautiful church next door. Approaching the crosswalk I noticed a half-dozen New York police officers standing at the curb – each armed with assault weapons and dressed in protective clothing. A German Shepherd police dog sat obediently among the officers. This, something you don’t see everyday on the streets of small town America, caught my attention. Add to the fact it was my first trip to New York City and you could say my senses were pretty much wide open to receiving new experiences and images. Exiting from the busy stream of people pulling me along the sidewalk, I pulled out my phone and quickly took a photo to show friends at home. Turning around I found myself staring into the biggest grin I’d seen in years from a man holding a broom and sweeping up litter around the trash can at the corner. Six foot tall and as warm as your favorite uncle, I couldn’t help but laugh with him. “I’m the guy who makes New York City look good,” he said with a genuine sense of pride and stressing the final syllables of the last word. “Absolutely,” I said holding up my phone. The entire time people are rushing around us on the sidewalk like we are a pair of stones in a stream of rushing water – only to those everyone else we are invisible. Once set, his broom and dust bin in place and again flashing his infectious smile, I captured a photo of this very special person. I found it ironic to be standing in arguably the most dynamic city in the world only to be reminded by someone who might easily be considered a background player that everyone plays an important role in the world we experience. Until that moment I’d found myself somewhat hypnotized by the glitter and wealth of the city – as I imagine most people when they first visit. Towers reaching into the skies, elevators racing tens of stories in the blink of an eye, and countless yellow cabs zigzagging along the streets below like ants racing to a picnic. All the material wealth, however, makes it too easy to forget there are faces beyond the rich and wealthy. Everywhere there are those without millions in their bank accounts who get up each day build the city the world so marvels. And those very same people, the ones who do not have their names written on the front of towers or business, are the ones who really make the city such a special place. I thanked my friend, we shared a couple more light-hearted laughs, and we both went on our way. But what he doesn’t know is he will always be one of the most remarkable people I’ve ever met. On that particular morning he reminded me to never get overly caught up in the glamor of what you see — remembering instead there is nothing more dignified than the work of those who built what you see around you.